Sister Elmera is now with her heavenly Father. Thank you for prayers for her soul. Please see obituary for details of her life and funeral arrangements. Elmera Keiser is one of our elder sisters living in St. Joseph Care Center. She crochets and likes to create greeting cards on the computer. She shared her call story in her own words. “When I was born, they thought I was going to die, and the doctor gave me mouth to mouth resuscitation. When he knew I was going to live, he said, ‘What a nice baby! She’s got to be a Sister.’ Many years later, when my father was on his deathbed, he told me that when Mother and I almost died as I was being born, he prayed that if we lived I would be a nun. I grew up with that always in my mind. One time I remember when my mother, my sisters and I were visiting, somehow the topic of becoming a sister came up, and I cried and said, “Do I have to be a Sister?” She told me that, no, I didn’t have to be a sister, and so the thought kind of left me. “I went to high school my junior and senior years at Hartington, and we had Ursuline Sisters. After lunch we would say a prayer for vocations. I always prayed for vocations, but not for myself. Then I taught in country schools for eight years. I fluctuated: I want to be a sister; I want to get married. I would go to dances, and before the dance I would pray for a date and after the dance pray to be a sister. I had the names picked out for the children I would have, 4 girls and 1 boy. For a while I had dreams about religious topics, including priests and sisters. I mentioned it to a friend who said that maybe that was a sign. 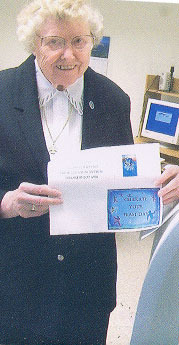 Sister Elmera enjoys making greeting cards on the computer. Elmera recalled many happy times teaching in one-room rural elementary schools, but says that prayer is the most important part of monastic life. She reflects, “When I was a young sister, teaching down town at Sacred Heart (Parish) School, S. Alphonsa told me that we should ‘pray all the time.’ I tried to do that. When working at the monastery in the summer, I liked to sing songs, like “You are My Sunshine,” “I Love You Truly” and “Let Me Call You Sweetheart,” and think of the words as being about Jesus. I used to write my prayers or type them–it helped me to think. I’ve been praying spontaneously for many years. Jesus is my friend. “My prayer style has been different over the years. We should be growing,” says S. Elmera. S. Elmera has been a Benedictine Sister for 68 years, and continues to learn, to grow and let go as she follows Jesus.